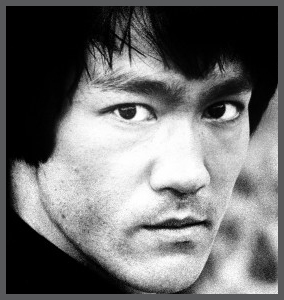 For many Bruce Lee simply represented Martial Arts, more specifically the founder of Jeet Kune Do. his balance in wholeness. He was a respected man, recognized and appreciated for his striking approach. He lived his life through his daily habits of philosophy and wisdom, and combined it with his radical style in martial arts, flair of dance movements and exactness of focus and form. It expressed his honesty and honor. He was an extraordinary man. Years before other inspirational and motivational speakers and writers, he emphasized the nature of water, its diverse component on how it takes on the form and shape of whatever object it is placed in. His collections of thoughts were molded after the Tao’s teachings. As he stated … “place water in a cup, it becomes the cup, place it in a bottle, it becomes the bottle …. Empty your mind, be formless like water. It can flow or it can crash. Be water my friend”. View this video on Bruce Lee. with his personal insights and philosophies. is experienced by the mind; but tomorrow that experience becomes mechanical, because I want to repeat the sensation, the pleasure of it – the description is never real. What is real is seeing the truth instantaneously, because truth has no future. There is no method to reality. – Do not reduce reality to a static thing and then invent methods by which to reach it. The law of cause and effect. – Every circumstance of every man’s life is the result of definite cause – mode and control are yours. On the need to remember. – Remembrance is the only paradise out of which we cannot be driven away. Pleasure is the flower that fades, remembrance is the lasting perfume. Remembrances last longer than present realities; I have preserved blossoms for many years, but never fruits. The necessity for acting on our beliefs. – Knowing is not enough; we must apply. Willing is not enough; we must do. The qualities of mind. – To be one thing and not to change is the climax of STILLNESS. To have nothing in one that resists is the climax of EMPTINESS. in oneself no contraries is the climax of PURITY. Sincere thought. – Sincere thought means thought of concentration (quiet awareness). The thought of a distracted mind cannot be sincere. thinking he stands off from what he is trying to understand. The value of ideas. – Ideas are the beginning of all achievement – in every industry, in every profession. If Bruce Lee was still alive, he would have been 78 years old on November 27th.